This English Language, 4.5 MB Adobe Acrobat PDF operating instructions handbook for the Panasonic DMC-ZR3 / DMC-ZX3 should prove to be a fantastic read, all 34 pages of it – be sure to download it. 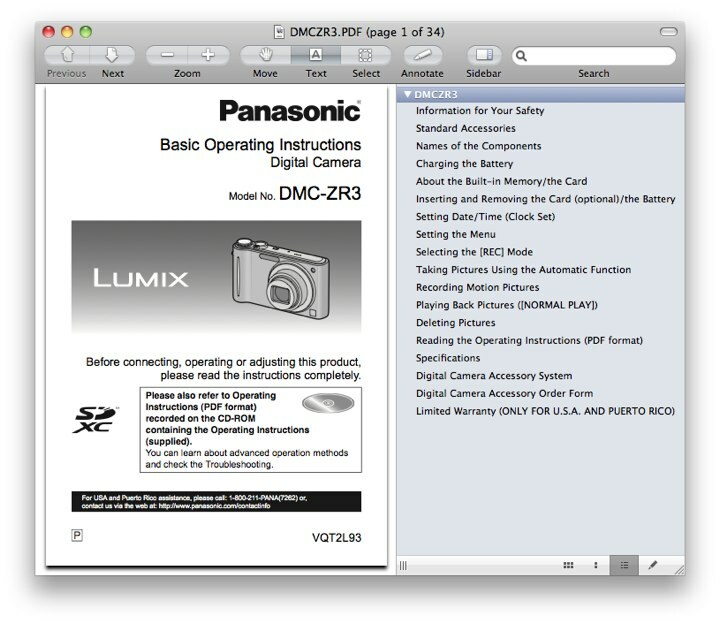 The user manual is titled “Panasonic DMC-ZR3 Basic Digital Camera Operating Instructions” (right-click and save the user guide to your hard drive). If the download link for the ZR3 user manual didn’t work for you, go to the Operating Instructions download section for the ZR3 and manually locate the download link for the file. Alternatively, you could visit Panasonic UK for the more advanced version of the user guide, or to download the manual in other European languages. 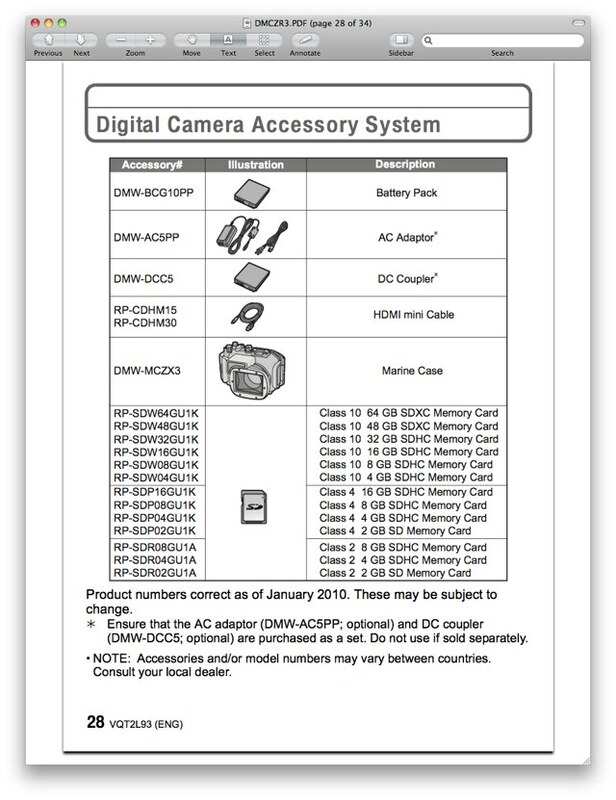 As previously mentioned, the Panasonic UK site has an advanced version of the ZR3 documentation, titled “Panasonic DMC-ZX3 Operating Instructions for advanced features”. Referring to the screen capture above, click on the second link (the one which says 11.9MB, or right-click and download from this direct link) to download the advanced manual. This PDF document is 12.5MB in size, and has 189 pages. 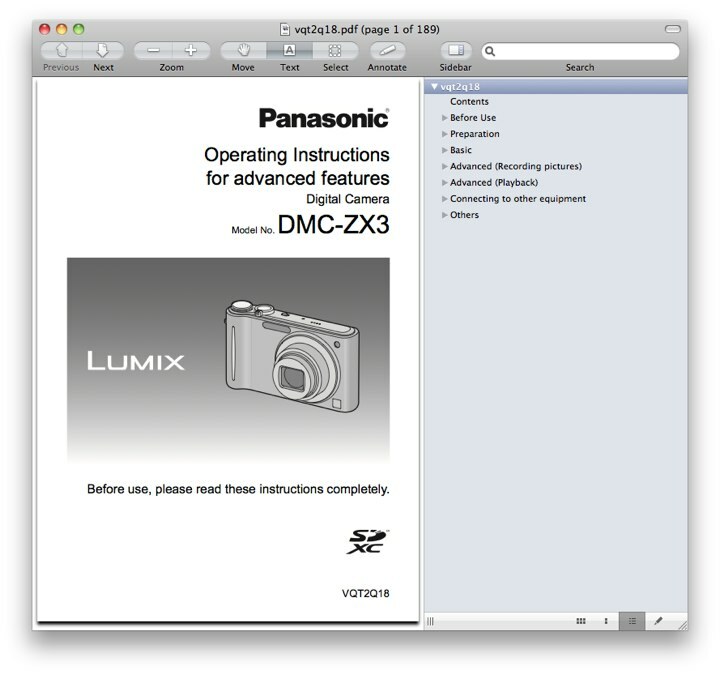 Unlike with Nikon, Panasonic allows you to freely print or copy portions from the DMC-ZR3 owner’s handbook without building in any password protection into the PDF. Both guides discuss the features of the ZR3 / ZX3, camera settings and tips on how to use the camera. You’ll find details of compatible accessories for the ZR3 on page 28 of the basic guide. Two examples are the 1.5-meter (RP-CDHM15 black) and 3.0-meter (RP-CDHM30 black, white) versions of the Panasonic Mini HDMI cables — these cables allow you to enjoy high quality pictures and motion pictures / videos / movie clips / footage on HDMI-compatible high definition TV sets.